My 3 older boys all suffer from eczema in some form. It is usually seasonal and appears most often in the cold winter months. The combination of hard water and cold dry air just drys out their skin so much. One of my twins, Luke, has a different skin ailment called Keratosis Pilaris. Unfortunately he has this year round, though it is worse in the winter. Keratosis Pilaris is small, rough bumps on the skin that primarily appear on the back of the upper arms. It can also occur on thighs and buttocks and even face, as you can see in the picture of my son's cheek below (he has it on all the body parts I mentioned).This is hereditary and unfortunately there is no cure for it and the suggested treatments really do not do much. From what I have read most children will outgrow it by adulthood, but what concerned me was that Keratosis Pilaris on the face can sometimes lead to permanent scaring. We believe that exederm is a simply sensible approach for anyone with eczema, dermatitis and dry or sensitive skin. With exederm it's possible to gently cleanse, to deeply moisturize and get smoother and healthier skin - without using unnecessary chemicals. In 2008, Exederm received 12 separate "Seal of Acceptance" awards from the National Eczema Association to acknowledge their ultra sensitive formulations. Exederm has a wide range of products for adults including moisturizers, washes and even haircare. They also have a line for babies/kids. 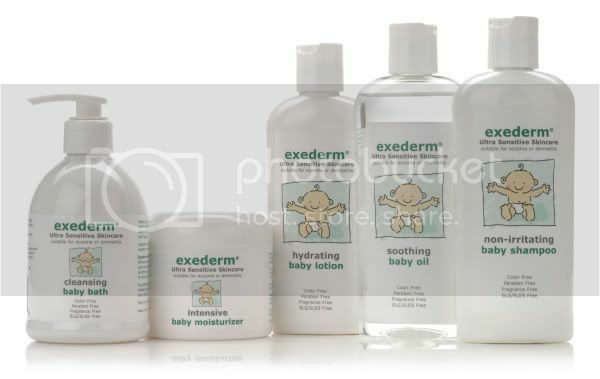 I feel very fortunate because Exederm was super generous and sent me the entire baby line to try out. I did not have any expectations that this would clear Luke's condition because I know that there is nothing that will do that. I just wanted to use products on him that would be less irritating to his super sensitive skin and if I was lucky improve it even just a tiny bit. The baby line consists of baby bath (body wash), baby shampoo, baby oil, baby lotion and baby moisturizer. Let me first say that I love that these products do not contain any nasty chemicals or irritants. Even some of the "natural" baby products out there will have irritants like Cocamidopropyl Betaine in them. I have been using these products during every bath time since I received them, particularly on Luke and new baby Daniel, and I am extremely pleased with the results. Both the wash and shampoo lather pretty nicely considering there is no SLS in there, and that is usually one of my biggest complaints when it comes to natural products. It gets everyone nice and clean. The lotion and moisturizer are great to put on right after the bath to lock in moisture. Now I don't really use baby oil often, but I read an interesting suggestion on the bottle. Add a little bit to the bath water to moisturize the skin more. I had never even thought to do that before. Just be careful because it tends to make bath toys a little bit slippery. I also use the baby oil on my baby's scalp. He is 3 months old now and has a little flaking on his scalp. So at the start of the bath I put some of the baby oil in his hair and I let it soak in for a few minutes. Then I gently scrape some of the flakes off with my nail and wash out. (Luke had the same thing as a newborn and my pediatrician gave me those instructions). It is clearing up a little more with each application. As I said I didn't expect for this to clear Luke's Keratosis Pilaris. I was just looking for something that would be less irritating to his super sensitive skin and would help with my other boys' winter eczema. 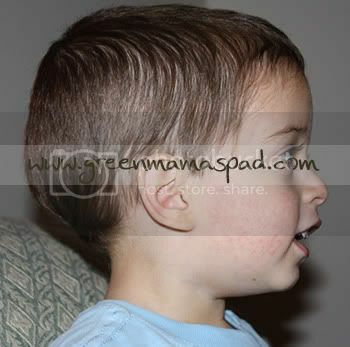 There was no change to Luke's skin condition, but I do feel that the Exederm products help to minimize flare ups. As for his twin brother Joshua and my oldest William, it worked really well for the dry skin they have during the colder months. They both will have dry skin all over but then tend to get scaly eczema patches on the back of their arms. By using all of the products, especially the lotion and moisturizer, I was able to eliminate those patches. My problem is with 4 boys to bathe at a time, I sometimes get so crazed that I forget to moisturize. Skipping that will just be counterproductive so it is important to moisturize every sing day. Especially after baths. All Exederm products can be purchased on Amazon or directly on Exederm.com. One (1) winner will be able to choose one (1) of the products that I reviewed from the Exederm baby line for themselves. Take a look at the products on the Exederm site and then tell me which one product from the baby line you would choose if you win. This giveaway is open to US Residents 18+ only and will end on Thursday, April 8 at 11:59pm EST. One winner will be chosen at random using Random.org and will be posted on the Winner's Announcement Page. Winner has 48 hours to claim his/her prize otherwise a new winner will be picked. You must leave your e-mail address in all of your comment(s) so I can contact you. I will not share your e-mail address with anyone, it will strictly be used to notify you if you win. Good luck! I was so excited to read your post because my son (3 years old) just got diagnosed with excema! Nice to know there are some specialty products out there we can look at. I would probably choose the baby lotion, since my son loves lotion anyway and primarily has problems on his legs. I found you on MBC. I would choose the moisturizer from the exederm line. I would love to try the lotion. My 2 year old suffers from Eczema and it is a constant battle. I would love to try something new to sooth her skin. I would try the intense lotion!! i would choose.Eczema Cream Moisturizer. I would choose the Baby Excema Lotion. I'd choose the Baby Eczema Shampoo. Thanks. My son has eczema and Exederm Intensive Moisture Cream might just do the trick. I would love to try the Eczema shampoo and conditioner on my granddaughter. I'd love to try the Baby Eczema Intensive Cream. I would get the eczema lotion. These products look super! I'd love to try the Baby Eczema Cream!